Glancing out of his window, the missionary saw that some goats had gotten into his vegetable garden. He knew that in a few minutes they would destroy much of the crop, so snatching up a stick, he hurried to chase them away. He was almost upon the goats when he stopped short in horror. He was face to face with three lions! 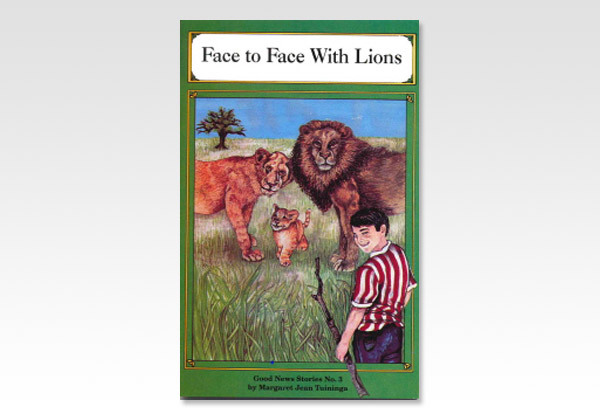 "Face to Face With Lions" is just the first in this series of twenty-three gospel stories for children. Margaret Jean Tuininga has woven the story of the gospel of God's grace skillfully and clearly into each story. The companion volumes, Lost in the Woods and The Doll That Grew, each contain further exciting stories especially suited to children in the four- to ten-year-old age group.